Ann and Jane Esselstyn are a mother-daughter team with decades of experience developing delicious, healthful dishes both for their family and for Dr. Esselstyn’s many grateful patients. Ann Crile Esselstyn developed the recipes for the New York Times best seller Prevent and Reverse Heart Disease and is co-author of The Prevent & Reverse Heart Disease Cookbook. A mother of four, Ann is currently focused on counseling heart patients to prepare and enjoy plant-based, oil-free foods. Jane Esselstyn, RN is a wellness instructor and a plant-strong presenter and cook, as well as a married mother of three, who has been eating this way for more than 25 years. Jane developed recipes for My Beef with Meat and is co-author with Ann of The Prevent & Reverse Heart Disease Cookbook. 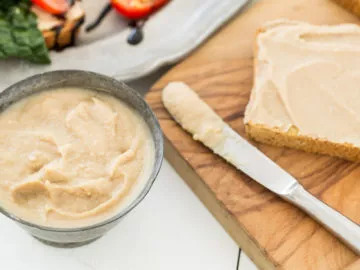 Serve this cannellini bean sauce over kale, greens, salads, grains, or veggies, or use as a spread for sandwiches or as a topping on pizza. 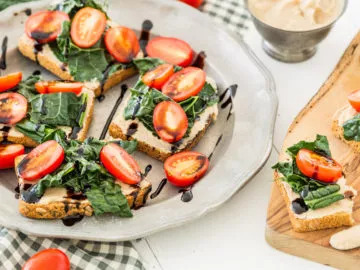 We adore kale bruschetta as an appetizer, and so does everyone else. It is always the first empty platter at our holiday party!